Fifty-five percent of those surveyed confessed to using their smartphone at least every now and then while driving. DEKRA Accident Research also discovered another disturbing fact: On average, seven percent of road users are distracted by their smartphones at any given moment. The experts at DEKRA Accident Research travelled across Germany in May 2017, observing more than 15,000 drivers for the purposes of evaluating distraction. At seven percent of all traffic observed, smartphone usage was by far the most common source of distraction. Furthermore, it was more common for drivers to use their phones around town (7.1 percent) than on country roads (6.7 percent) and on the autobahn (5.8 percent). In this video, the experts will show what happens when you use the smartphone while driving. DEKRA on smartphone distraction at the wheel from DEKRA on Vimeo. “Unfortunately, far too many drivers remain oblivious to the degree of danger they subject themselves to when using their phones at the wheel,” says DEKRA Board Member Clemens Klinke. Studies and estimates both from Germany and the USA show that one in every ten traffic fatalities is caused by distraction. In Germany, this equates to 320 lives lost – far more than those killed through drink driving (225 fatalities in 2016). “We need to ask ourselves the question: how many of us would willingly close their eyes while driving, even just for five seconds? You can be sure that it would be a very low number,” says Klinke. “Despite this, checking one’s smartphone while driving is entirely normal for a great many of us. But the effect is the same.” If you were to glance at your phone for three seconds while driving at 50 km/h, you effectively drive blind for almost 42 meters. For five seconds of smartphone use, it’s almost 70 meters. The likelihood of using a phone behind the wheel of a vehicle is largest for younger drivers. 85 Percent of 18 to 29-year olds are guilty of this, according to the DEKRA/Forsa survey. In the 30 to 44 age bracket, more than three quarters (77 percent) of those surveyed confessed that they occasionally reached for the phone while driving. Even the majority of 45 to 59-year olds (54 percent) admitted the same, and in the over 60s age group, more than one in three (34 percent) use their phones while on the move. The most common reason to pick up the smartphone is to check incoming SMS or WhatsApp messages. Over a third of all drivers (34 percent) admitted to at least occasionally reading these while at the wheel. 25 Percent accept incoming calls without using a hands-free system. One in five (20 percent) write messages themselves, and around one in six (16 percent) make outbound calls without the benefit of a hands-free kit. Less frequent were the usage of social media (6 percent) and smartphone games (3 percent). The usage of smartphones needs to be just as taboo in society as driving after consuming alcohol. More checks could be one way to help this. Only four percent of drivers admitted having been stopped or checked by the police for phone usage while at the wheel. In 2015, the most recent year for which the German Federal Motor Transport Authority provides data, 363,000 phone violations were registered to the national driving fitness register in Flensburg. The number that go unreported is, however, sure to be far higher. Driver consensus is clear: 85 percent of those surveyed by Forsa spoke in favor of more frequent phone checks. Even the most prolific users of smartphones while driving voted 79 percent in favor for more regular checks. More than half of all drivers believe that the current 60 euro fine and one demerit point is much too mild a punishment for being caught using a phone while driving. Sanctions are harsher in many other European countries. 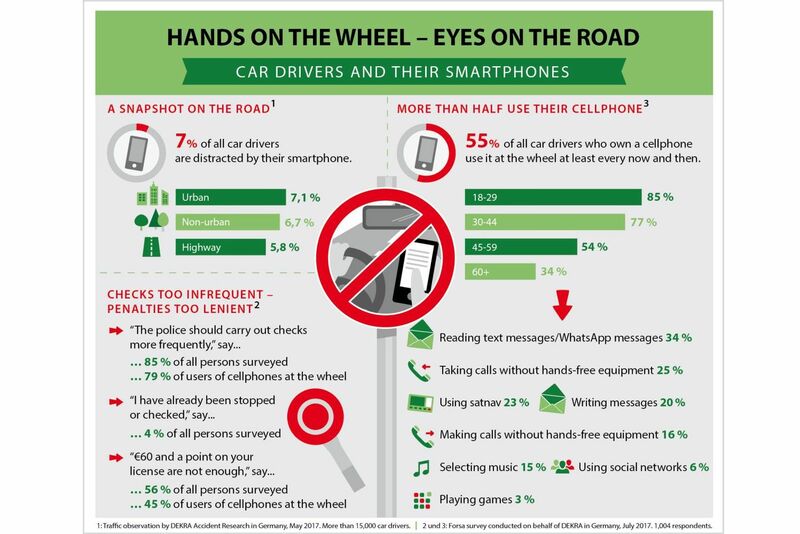 Distraction by smartphone isn’t just an issue for motorists. Other road users such as cyclists and pedestrians are commonly distracted too, and themselves cause critical traffic situations. An analysis carried out by DEKRA Accident Research in 2016 across six European capitals revealed that 17 percent of all pedestrians crossing the road did so while distracted by their devices. The DEKRA expert’s appeal to all drivers is therefore plain and simple: Hands on the wheel, eyes on the road. By the way: On the website www.dekra-smarter-traffic.com, DEKRA experts explain the Dos and Don’ts when it comes to smartphones and road traffic.